Most people dream of running away to the circus, but Anthony actually did it. After growing up in Thurso on the north coast of Scotland and moving down to Edinburgh, he eventually joined and toured with Albion Woods Circus performing as an escapologist, bed-of-nails man, clown, ladder of swords climber and pig wrangler, before deciding to take a more legitimate route into theatre by attending the Royal Scottish Academy of Music and Drama. Following college, Anthony spent time working with various Scottish repertory and touring companies. It was at this time that he was cast as Doctor Colin Crawford in an episode of Taggart. The character was originally only intended for one episode, but was successful enough to have further storylines written for him. Anthony made the move down to London and was quickly taken on by the Royal Shakespeare Company, first on a tour of Julius Caesar directed by David Thacker and then as a member of the permanent company in Stratford and at the Barbican in London. In the early 90's Anthony first worked with a small British American collaborative theatre troupe based in the states. Aquila Theatre was building a reputation for innovative ensemble productions of Greek and Shakespeare plays. In addition to playing leading roles such as Brutus, Lear, Cyrano, Benedick, etc, working with Aquila gave Anthony a chance to pursue his other great interest in music. From early days as a drummer and keyboards player with various local bands, Anthony has developed as a composer of powerful and filmic soundtracks that are perfect for the dynamic Aquila style and are a major contribution to the tenor of the company's work. Aquila moved to New York in 1999 and gained a reputation as one of the most popular and reliable producers of off-Broadway classical work, their reputation growing with every production. 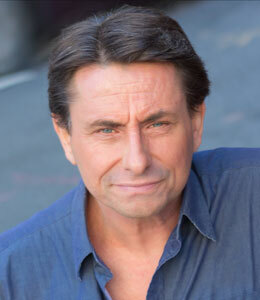 Having distinguished himself as a leading actor, Anthony expanded his experience in the states with roles in award-winning Broadway productions at Lincoln Center Theatre in New York, the Folger Theatre in Washington DC, Yale Repertory Theatre, The Old Globe in San Diego, Alabama Shakespeare Festival, The Shakespeare Theatre Of NJ and Others.